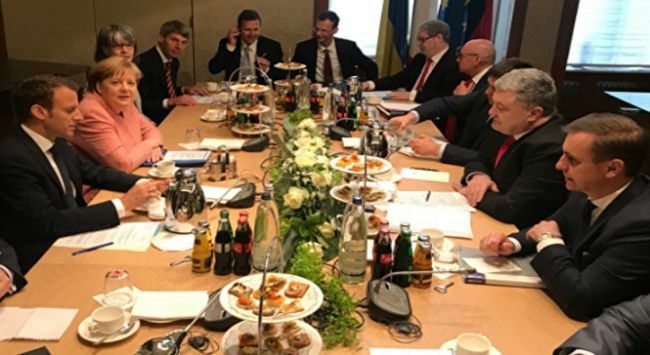 The much-touted by the Ukrainian government Petro Poroshenko’s visit to the German Aachen for a meeting with the leaders of France and German was fruitless. Berlin and Paris’s attempt to have talks separately with Russia and Ukraine within the Normandy format proved to be non-constructive. The failed attempt to agree on something without Moscow has shown again that decision making on key issues on the Donbass crisis is impossible without Russia and the USA, while participation of France and Germany (and even Ukraine) in the negotiation process is not necessary. Director of the Perspectiva Information and Analysis Center Pavel Rudyakov commented on the Poroshenko trip to Vesti Ukraine. According to the analyst, in Ukraine, the event was shown as “a meeting without Putin, almost a Normandy format meeting, so there were certain expectations” that it would include all protocol events including a joint briefing. “But the meeting was not of the kind it was written of in Ukraine to raise its status. It was not a meeting of three leaders, it was a Charlemagne Prize ceremony attended by Poroshenko,” Rudyakov said. He explained that the protocol did not include a joint briefing of Poroshenko, Merkel, and Macron. “They could not decide anything at the meeting, as whatever they decided, it was to be coordinated with the USA and Russia,” the Ukrainian analyst concluded. Ukrainian media draw attention to a significant fact: only Petro Poroshenko spoke in detail about the “talks” after they took place. Merkel and Macron said a few words, as there was nothing to speak about.